This online course is designed to equip participants with essential fire safety knowledge and the procedures that they need to follow in the event of a fire in the workplace. This course has been built around legislative guidelines that outline causes of fire, fire prevention, different types of fire and how to deal with a fire upon discovery. 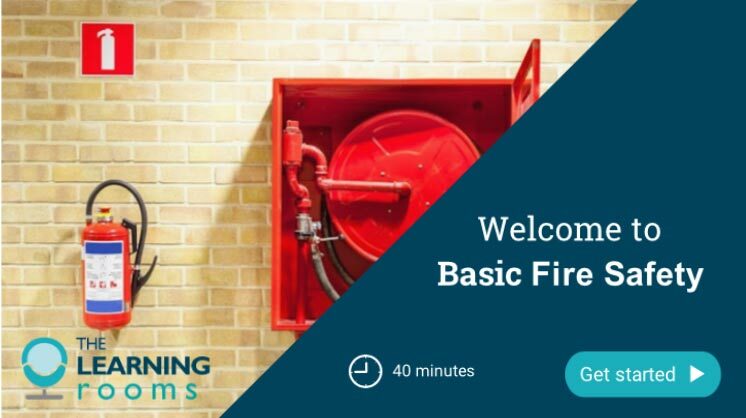 This course equips participants with the skills to identify fires, potential fire hazards and fire prevention to help maintain safety and that of colleagues. This Fire Safety eLearning course is designed for anyone wishing to improve their knowledge around fire safety in the workplace. Deliver this Fire Safety online course throughout your organisation to ensure all employees are aware of what to do in the event of a fire and how to prevent fires in the workplace. Classify the types of fire. Identify the types of fire extinguisher. Choose the correct fire extinguisher for each fire type. Carry out the correct procedure on discovering a fire. Outline practices for fire prevention. Follow the correct evacuation procedures. To receive the fire safety awareness online course certificate, the learner must complete the course and score 80% in the assessment. If you want to book a number of places on this course, or deliver it on your own organisation Learning Management System (LMS) please contact HMI.